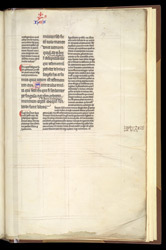 The books of the Bible had received standardised sets of glosses (interpretations and explanations) during the 12th-century, and these continued to be copied and studied in the 13th century. As is typical in such books, the biblical text is written in larger, more formal, script and the gloss is written in smaller script to either side and between the lines. This volume containing the glossed Gospels forms part of a set which was owned by the 'Preaching Friars' (i.e. Dominicans) of London: they were established in about 1221 at Holborn, and moved to Ludgate in about 1275. At the very end of the text, in the right-hand margin, is a contemporary note of the extent of the decoration, which was probably recorded as a means of calculating payment. It says 'In this volume are 7,349 small letters and paraph marks [like the two red paraphs on this page], and 1,619 large letters'.